The objective of this chronic management module is to foster self-management and assistential continuity in order to help health spenders to achieve an integral management of the chronic population and help the patients to improve their diseases management. Efficiency improvement of the health resources. Increase of bed availability in the health centers. Reduction of unnecessary hospital stays. Reduction of hospital waiting lists. Patient gets personalized care, improving their life quality, privacy and wellness. Guides and some other recommendations to maintain healty lifestyles. 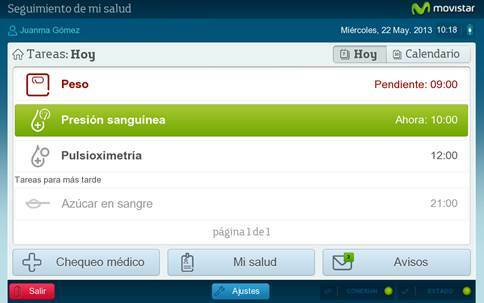 The module is designated to be used by three profiles: Doctor, patient and administrator. 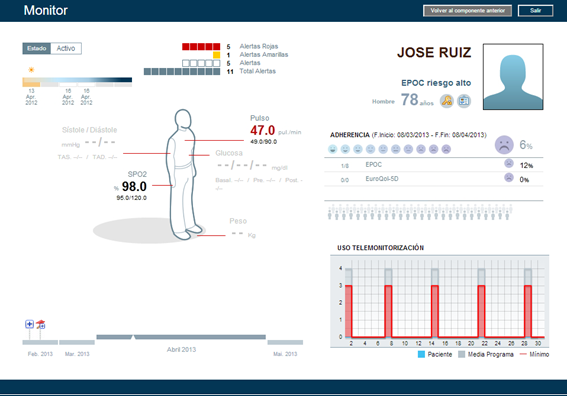 Management module allows the health professionals to maintain a remote tracking of the patient. 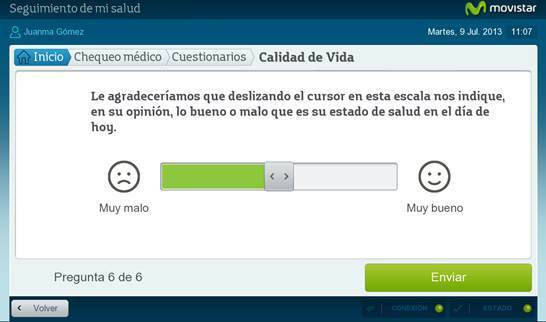 The doctor can adjust the careplan and coordinate actions with the rest of doctors in the hospital. The system is the base to take clinical decisions of the patient included in the service. 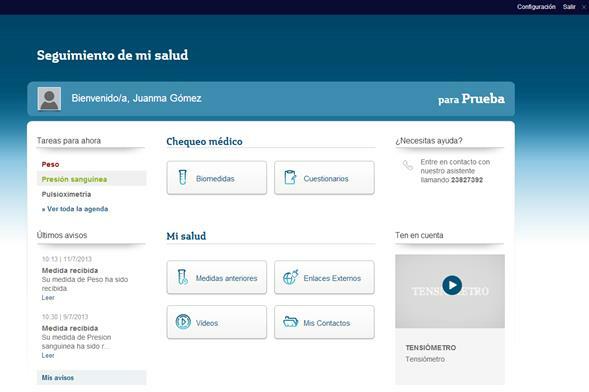 This systems offers a enjoyable interface integrated with the patient info lodged in the platform. Health staff will use the patient management system and programm tracking oriented to palliate the chronic effects of their illnesses.. The patient registration can be made manually, through file loads or, automatically through integration with other tools. o Use frequency of telemonitorization. o Percentaje of filled questionnaires. o Temporal line of important events. o Current password and password change option. The module counts with a complete videoconference system that allows an accurate communication channel among doctors and patients. The patient will have a KIT consisting on a Tablet and the different devices needed to monitor their diseases: Glucometers, tensiometers, bleach, pulse oximeter among others. 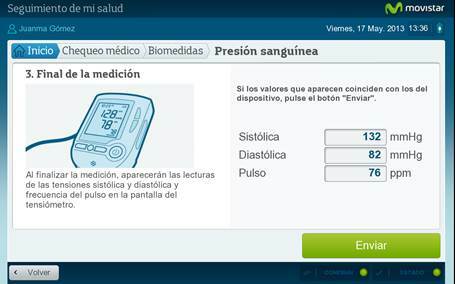 User can monitorize their health through the tablet, web or smartphone. 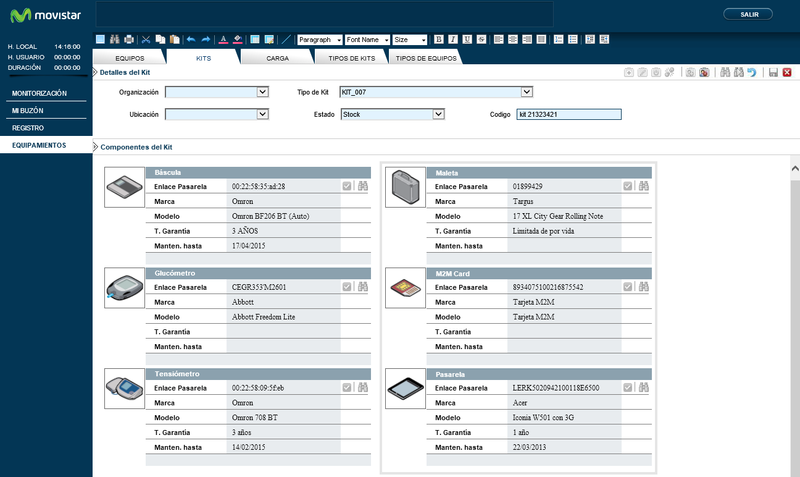 After logging in, the dashboard is displayed, from there any section of the platform can be accessed. • Today. Scheduled activities organized by start time. Clicking on them the user will access to it directly. 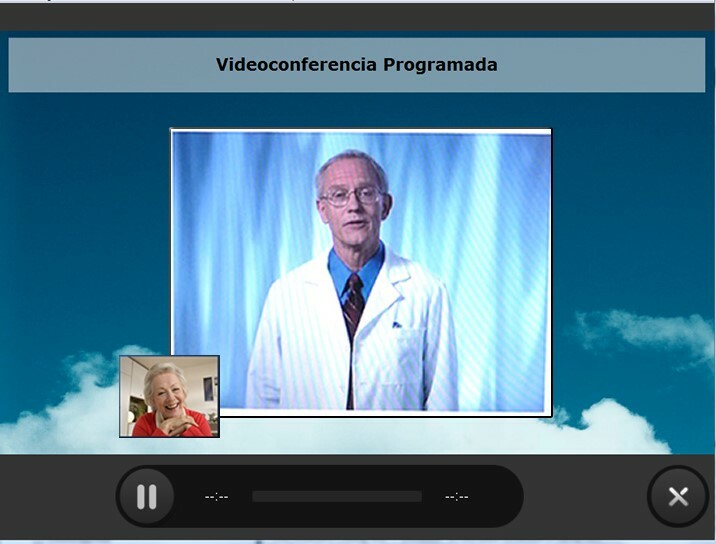 • Video Conference: Access to a videoconference system with the health personnel. • Medical check. Clicking on this button gives access to the realization of bio-measurements or questionnaires to follow the patient’s health. • My health. 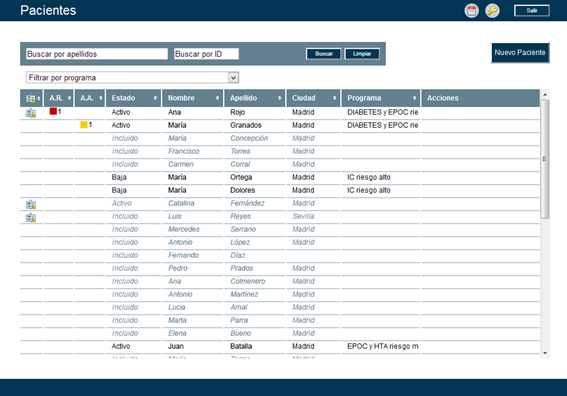 It gives access to the videos, graphics with the history of bio-measurements, the contact of the technical support and the list of external links. • Warnings. List of messages sent to the patient. • Settings. 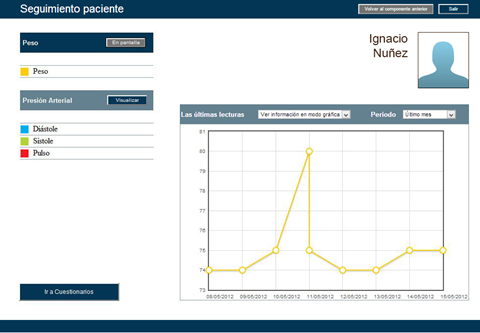 Customization of the patient application (language, devices, password changes, alerts…). The patient will be able to access the active medication treatment prescribed in the current day. The treatment will be displayed in a clear and detailed manner specifying the type of drug, dosage, recommended time or time of day (fasting, after lunch, etc.). When a change in treatment occurs the patient will be notified expressly and any changes in the treatment will be emphasized helping the patient to identify them. The patient will be able to automatically monitorize the bio-metricss prescribed by his doctor according to the care program that the user is assigned to. • Oximetry or saturation level of oxygen in blood (%). 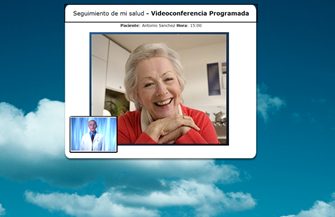 The patient can access to a videoconference system with the health personnel from his mobile device or PC. Symptomatology related to the specific clinical condition. Each care program will be associated to the relevant questionnaires in order to manage remotely their diseases. General health and welfare status. These questionnaires are understood as contents of the platform and are configured and assigned to the patient from the Clinical Management Tool. The operational management is divided into two submodules, the “Service Administration” and the “Service Operation”. The Service administration module provides the necessary tools for the registration of a new client (healthcare provider) and its associated processes. The Service Administration is normally managed by Telefonica’s own personnel (not the customer). 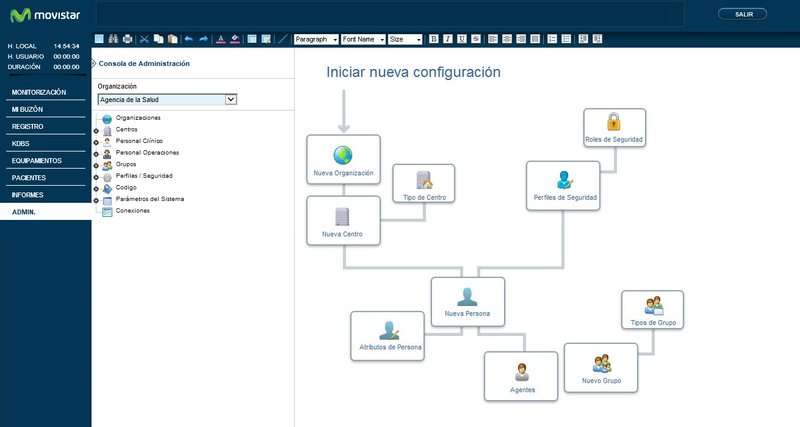 The Service Operational module provides the tools for management and maintenance of the services operative tasks, such as the management and monitoring of equipment assigned to the patient, events and alerts. 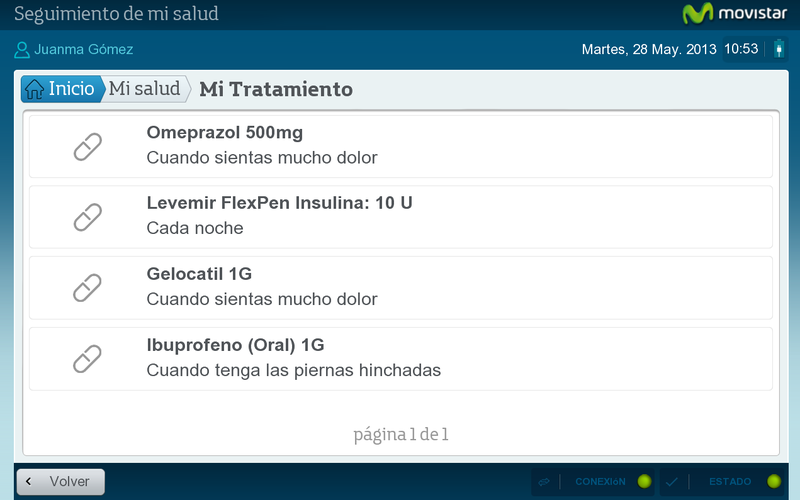 Telefonica and Init Group are business partners in the digital health market.  Telefonica contributes with its RPM product and Inith Group with its health management platform .